Specialising in 20th century design, Modest Furniture is just the right place to find vintage pieces. 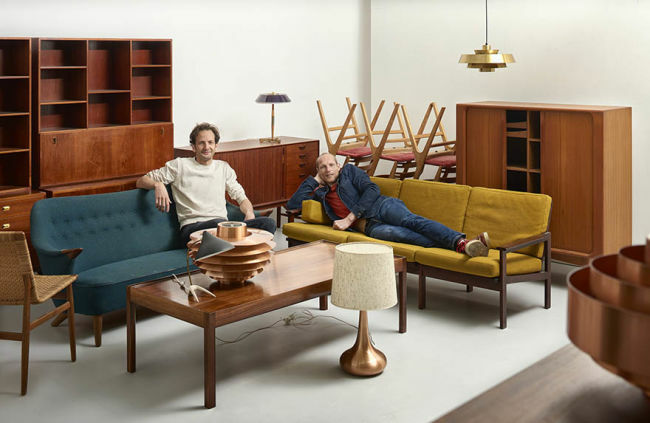 We offer a wide range of mid-century furniture, lighting and decoration, combined with a selection of fine art from the period. Established in 2011, Modest Furniture is more than just an online gallery. At the heart of the company are craftsmanship and service. Its founder, Vincent Lemson, inherited the hands of his tailor-grandfather and learned the skills of restorer and upholsterer from an early age. Not so much later, his good friend Arne Jennard joined him. With an education in industrial design, and working as an architectural photographer, he is the ideal complement. Our motivation lies in the preservation of aesthetically pleasing, historically relevant or simply interesting mid-century design and passing it on to a new generation. Every link in the chain from sourcing to delivery is carefully managed by our team. We source our items mainly from Europe, by travelling from North to South, from Scandinavia to Italy and back. Each piece gets the treatment it requires, a damp cloth when time has been gentle, a full restoration when times have been rough. We aim to strike the right balance between keeping the ‘patina’ and restoring the functionality for a new life. Not only do we care about our collection, we also care about our clients. Dealing with high quality pieces with a rich history is not merely about buying and selling. We are happy to speak to you on all kinds of media, but most of all we like to welcome you into our showroom where proportions and materials, colour and texture become reality through all the senses. Experience is key.